Make your work environment safe. Fall arrest is of two major types: general fall arrest, such as nets; and personal fall arrest, such as lifelines. The most common manifestation of fall arrest in the workplace is the Personal Fall Arrest System, or PFAS ("lifeline"). A – Anchorage – a fixed structure or structural adaptation, often including an anchorage connector, to which the other components of the PFAS are rigged. B – Body Wear – a full body harness worn by the worker. C – Connector – a subsystem component connecting the harness to the anchorage – such as a lanyard. 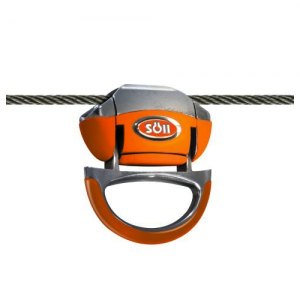 D – Deceleration Device – an essential subsystem component designed to dissipate the forces associated with a fall arrest event. It is good practice and recommended that these are also included in Restraint systems, in case of foreseeable mis-use. E – Emergency Plan & Equipment – a clear and simple approach to rescue of a suspended worker following a fall arrest event. All workers should be familiar with the site specific plan and competent to implement it. If a suspended worker is not recovered in good time, they may suffer the potentially serious effects of "suspension trauma". As we are Rope Access company, safe work at heights is our priority. That is reason we provide full service fall arrest systems delivery, we are not just a seller, we provide full service from consulting till maintences. We represent two company production which gives us a chanche to offer the best variation for each client. Our company represent in Latvija SOLL and Somain Italia productions of fall arrest sistems.